BBC News - Q&A: Why is the UK still stuck in recession? Q&A: Why is the UK still stuck in recession? The eurozone has officially left recession now, ending a contraction that began in the second quarter of 2008. France and Germany continued to grow, leading the other countries that use the euro out of recession. In addition to the two powerhouses of continental Europe, countries like the US, Japan, Italy and even Slovakia have now left recession. Yet the UK is still mired in its worst slump since World War II. Previous UK governments have praised the resilience of the economy and its ability to adapt when times get tough. If that is true, why has everyone else emerged from recession before the UK? Is there a big difference between the economies? The UK, along with the US, was right at the heart of crisis that led to the global downturn. Our financial sector is much larger than those of our partners in the European Union, so when the credit crunch struck, the impact was much more serious for the UK. Germany and France have experienced problems in their banking sectors too, but unlike the UK, they have not had to intervene in the sector to the same extent. Germany is the manufacturing heart of Europe. It relies upon exports to fuel growth. So its biggest problem has been the huge fall in global commerce, which the World Trade Organization predicts will have contracted by 10% this year. That fall led to a sharp contraction in German growth. In the first three months of the year, while Britain's economy shrank by 4.9% on an annualised basis, the contraction in Germany was 6.7%. From the height of the boom to the depth of the recession, the fall in output in Germany was much greater than in the UK. 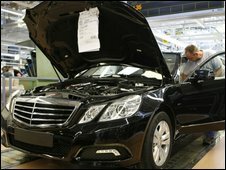 But as the global economy has started to recover, German firms have been cranking up production lines and rebuilding stock levels. They have also been responding to a pick-up in domestic demand, all of which has contributed to growth. Meanwhile, the financial sector generally is recovering too, but few expect it will return to the levels of activity seen before the crisis anytime soon, so that will have a lasting impact in the UK. So was all the money the UK government spent on stabilising the economy wasted? According to figures from the International Monetary Fund, the UK's discretionary fiscal measures, essentially the cut in VAT, accounted for around 1.6% of total UK economic output this year. It will fall to zero next year as the VAT cut will disappear. Germany also provided 1.6% of GDP, but it will add a further 2% next year. 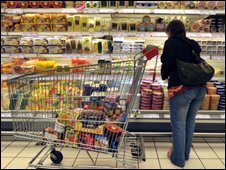 The French measures are more modest, amounting to around 0.7% both years. So the UK economy may have enjoyed an early fiscal boost, but it was only on a par with Germany. And unlike France and Germany, that boost will not be continued into 2010. France and Germany have also benefited from what economists call automatic stabilisers. Their social security systems are more generous than the UK's and this has provided more support to consumers. It is one of the reasons why they argued they did not need to follow the UK with headline-grabbing measures to stimulate the economy. But one area of direct intervention does appear to have helped German growth. Its car scrappage scheme has been credited with turning around the fortunes of its automotive sector. At 5bn euros ($7.1bn; £4.3bn), it was on an entirely different scale to the UK's £300m scheme. The UK has spent far more as a proportion of GDP bailing out its banks - an estimated total of more than £1.5tn, before you take into account the recent extra money pumped into troubled lenders Royal Bank of Scotland and Lloyds Banking Group. That also does not include the £200bn the Bank of England has pumped into the economy through its quantitative easing programme. This is greater than all the G20 countries, but then its financial system was arguably in a much deeper hole. Is there a more fundamental problem in the UK? The UK was more exposed when the downturn struck, and not just because of its reliance on the financial sector. UK consumers are more in debt than those in much of mainland Europe. It is a legacy of a preoccupation with property ownership and the huge levels of credit, which supported the economy for so long. 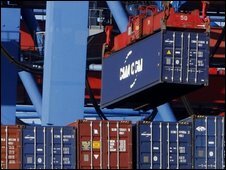 It means that while Germany and France are seeing the return of some domestic demand, consumers in the UK will not be able to simply spend their way out of the recession. Bank governor Mervyn King said on 11 November that the UK economy had "only just started" along its road to economic recovery. It will be late 2011 before the UK economy recovered to the level it was at before the recession, he said. Whether the UK government and central bank's measures have really helped boost the economy remain an open question. Economists point out that growth in the eurozone is weaker than expected. Few have ruled out the countries experiencing further quarters of negative growth. Governments will not be able to prop up their economies forever, so the stimulus programmes will have to end. Unemployment has also remained high throughout much of the West, so if there is a recovery underway, it is still a fragile one. But if the French and German recoveries gather pace, that would be good news for the UK, because they remain some of its most important trading partners. Nonetheless, the speed with which the eurozone has emerged from this recession is likely to reignite the debate about just how robust and flexible the UK economy has turned out to be.